As you know, my students are not the average American kids. They are missionary kids who live here on campus at Good Shepherd's Fold in Uganda and are friends with the children who live at the orphanage. They are an important part of the ministry here. All of these kids have also lived part of their lives in other countries: Singapore, France, Mauritania and the US. 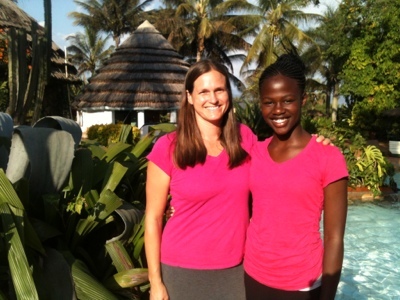 Four of our students are Ugandans who were adopted by Claudia, a single woman who has been working here for 15 years now. Here is a picture of Maggie, one of Claudia's daughters, and me. This picture was taken at Elijah's birthday party. She and I often find ourselves wearing matching clothes, so I tease that she is my twin. It is such a blessing to be able to teach, learn from, mentor, and walk through life with these kids. I probably learn as much from them as they learn from me. This afternoon Caralina, our oldest student, went with me to the local hospital to visit Judith and her daughter Rebecca. It was good to do that together. I am so blessed by God's work in the hearts of these young women and men in our school. I look forward to seeing how God continues to work in and through all of their lives. And I am very thankful for the reminder today that God is a Father to the fatherless. He will never leave us or forsake us. And he cares deeply for his children!